LONG-TIME Philippine tennis sports patron and Davis Cup team manager Jean Henri Lhuillier is upbeat of the team’s chances in next week’s tie with Indonesia, citing the intense preparations being made by the team. The Philippines hosts Indonesia in the first round of zonal tennis tournament to be held at the Philippine Columbian Association shell-clay courts in Paco, Manila on Feb. 3 to 5. “We have assembled a very strong squad that is a nice combination of youth and experience. All of them have been competing a lot and have toughened up in international competitions and have been doing well. The goal for this year is to win all our matches to move back to Asia-Oceana Group 1 next year and I strongly believe that this team has what it takes to accomplish the task,” Lhuillier said. The team is bannered by world-class doubles’ specialist Treat Huey, who is ranked 22nd in the world and is fresh from campaigning in the Australian Open. Joining him are Francis Casey Alcantara, Ruben Gonzales and world-class junior netter Alberto Lim Jr.
Alcantara is coming off a strong campaign last year, rising to world no. 875 in singles’ rankings to become the country’s number 1 singles player. Gonzales has been a force to reckon with in international doubles’ competitions with a ranking of 242. Lim on the other hand is ranked 35 in world juniors and is currently seeing in the Australian Open Juniors. 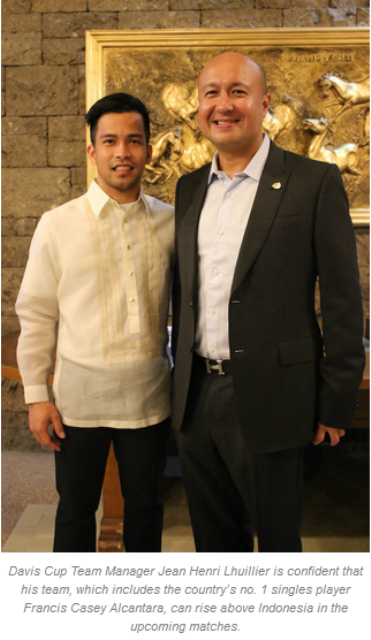 Karl Santamaria will serve as team captain while Martin Misa will be the Philippine Davis Cup administrator.